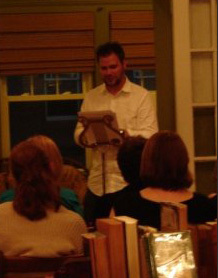 Reading at Wolfgang Books, Phoenixville, PA.
seemed broad and straight and sweet. the splintered shell of a fountain pen. the scent of carelessness clean, and lemon fresh. as I drew curlicues around a scab. a syrupy ooze blackened my teeth. rather than the blunt and deliberate drive of granite. another blot that wouldn’t dissolve. from the back seat of the family Duster. those moon-booted creatures in Kabuki faces. of mystery and chip-chopped ham. The Demon filled most of my silences. deep with the shadows of an ancient seduction. one of their records. I was eight, maybe younger. with me eight times on Showtime. after I knocked on her door to tell her I was going. Luke got his hand sliced off, then learned Vader is his father. as if it were a kind of love. Han and the princess alone together on the Millennium Falcon. between us, the pull of two planets falling briefly into line. that circles dock and harbor. as if to bite something just out of reach in the night air.